Ai Weiwei, Gilded Cage, 2017. 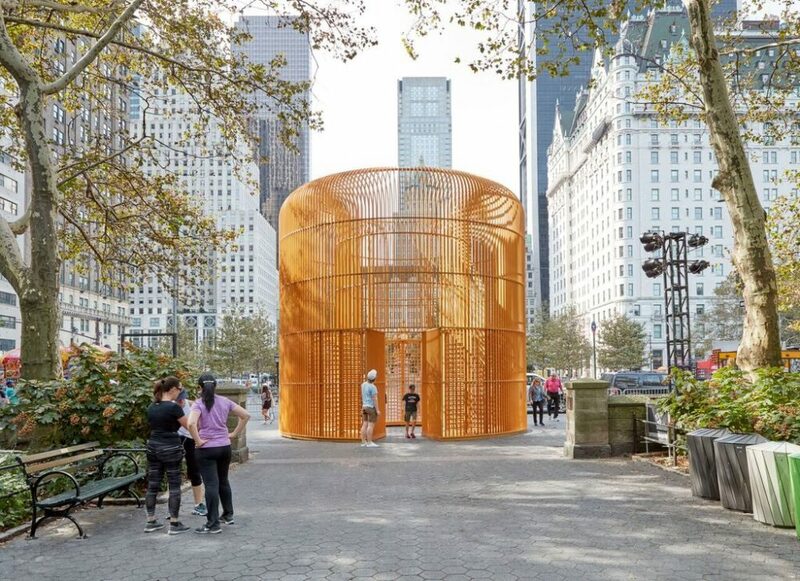 Last week, at the base of Central Park, a yellow leaf fell through the narrow openings in Ai Weiwei’s new public sculpture, momentarily matching its color, before landing at the feet of two African pedicab drivers. The men were switching between swapping jokes in French and asking tourists in English, “Where are you from?” as they held up laminated signs advertising their services. Those being approached scurried into Ai’s structure, using it as a convenient excuse not to engage, hiding behind its bars. The piece is one of over three hundred works included in Ai’s citywide Public Arts Fund project, “Good Fences Make Good Neighbors.” This one’s title, Gilded Cage, constrains the structure to a cliché, even though its bars are painted more of a burned orange matte than gold, and its gaping opening defies captivity. Two concentric rings, which extend vertically from the pavement in towering, unscalable metal bars, form a beaker-shaped prison big enough for a handful of people. The outer ring is an inaccessible passageway at odds with the architecture of movement it contains: a sequence of turnstiles not unlike the ones just underground, whirling with commuters. If you pass your arm between the bars, you can shove the turnstiles into a spinning motion, though no bodies can pass their thresholds. From behind the bars another bright structure may catch your eye: Augustus Saint Gaudens’s gilded-bronze equestrian memorial to William Tecumseh Sherman. I walked over and saw a Sikh couple waiting for their turn to take a picture, after two Chinese teenagers managed to get a selfie that framed up their smiling faces, the statue, and its identifying text below. Sherman’s gleaming horse was frozen charging toward the living ones taking their dinner break around the plaza, along with their Latino carriage drivers, dressed in top hats and three-piece suits. I noticed that on one of the nearby carriages two flags had been pinned to either side of a bouquet of fake flowers: one for the United States, the other for the Ivory Coast. As I traveled around the city to find Ai’s pieces, I found myself playing this game of adjacencies, unsure if what I noticed was accidental or intentional. The Public Art Fund website hosts an interactive map on which pins swarm the city streets, identifying banners, posters, and sculptural works, but not the mundane facts of the city that might resonate or rhyme with the pieces. Without the map, you would have to know to look for the work to see it. At 48 East Seventh Street, a narrow panel of wire mesh fence fills a vacant space wedged between two buildings. It’s almost like a smirk: in this city where every square foot can be sold for an exorbitant price, this empty slice of sky had been unclaimed. With openings on bottom and top that are easy to sneak through, Ai’s barrier is symbolic, more “enter at your own risk” than “no trespassing.” On Christie Street, another wire mesh fence is propped like a billboard on the roof of a building. Set back from the façade, it is hidden from the sidewalk below. I passed it twice and had to cross the street to see it, standing with my back to a large functional version of the same fencing that bordered a playground, a soccer field, and a basketball court. Watching the men and children playing inside, I noticed the expressionistic potential of Ai’s chosen medium, how the wire bulged outward, its diamonds deformed and stretched, tugged apart from the structure’s beams, as if the entire area were fat with an invisible crowd or force. Ai has chosen to keep his materials aloof and pristine throughout this project. Across the city, advertisements in bus stops have been replaced with his own posters. The blocks of Helvetica text that cite statistics and quotes about the refugee crisis impose a glossy ease on the information and reduce the evocative photographs behind them to backgrounds. And yet, when Ai relies on imagery alone, it feels like important contextual information is missing. Two hundred banners stretching from street lampposts bear high-contrast black-and-white photographic portraits of historical and contemporary refugees. A friend told me she took them for a clever, if opaque, advertising campaign. Her interpretation has some truth to it. Both advertisement and campaign are words applicable to this project, which vacillates between an eye-catching and a subliminal promotion of information, without ever quite grazing a call to action. 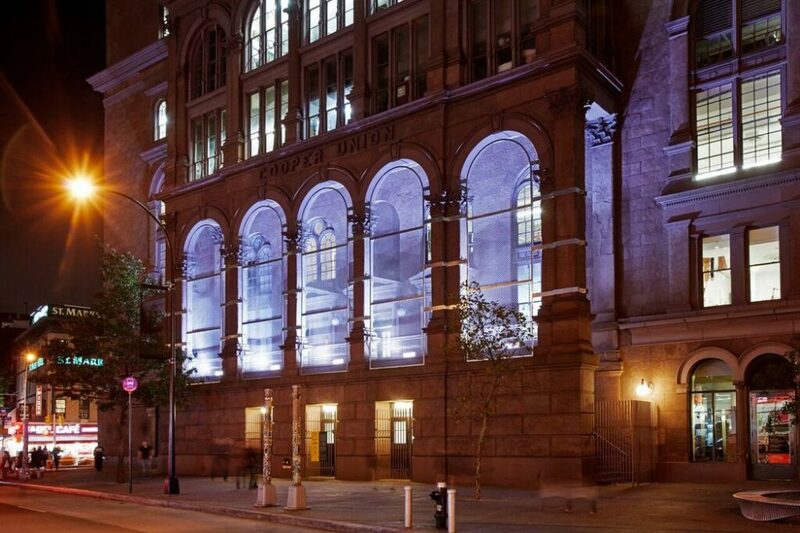 The “Five Fences” bracing themselves to the arches of Cooper Union may have been meant to evoke the barrier to entry caused by the college’s newly instituted tuition, but the intervention looks more like some kind of structural bolstering device. Neither the figures moving in the yellow-lit interior nor the thirtysomething man leaning against the façade in his skinny-tailored suit, smoking a cigar, seemed affected by it. The women heading home from church in downtown Brooklyn last Sunday were only mildly intrigued when I asked if they had noticed the cage-like structure looming over the bus stop at which they were sitting. Ai calls these pieces “shelters,” but the lip extending from their lower edge offers a highly uncomfortable seat. If you squint, you can see a politics in that. The “global migration crisis,” as it is so vaguely and broadly referred to in all of the press releases, label placards, and website, is everywhere, but you have to know to look for it. Migration, whether forced or necessary, is not an event but an everyday experience, a status that limits and oppresses daily life. Those who are fortunate enough to remain happily where they were born automatically have a sense of identity at odds with and ignorant of the risks and hazards refugees face. Duchamp’s influence on “Good Fences” is explicit. 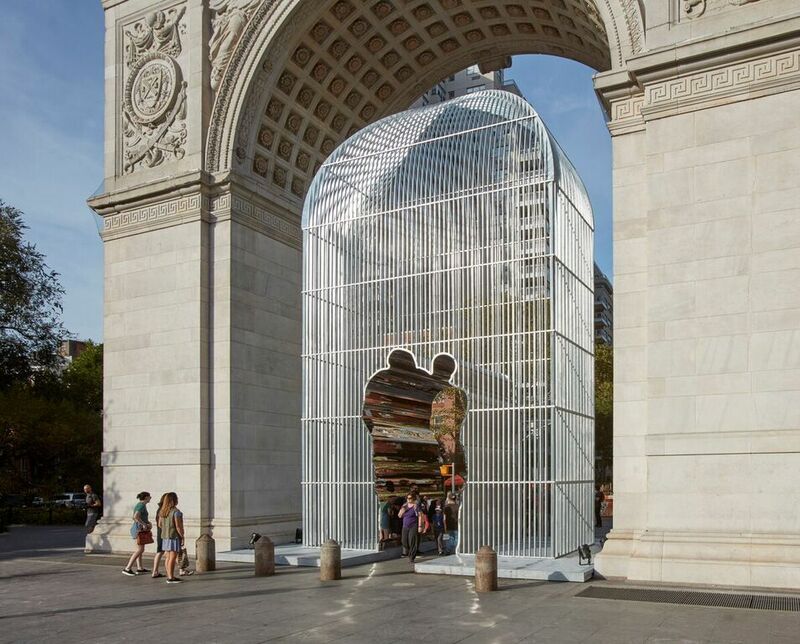 Under the Washington Square Park arch, Ai installed a massive, silver birdcage-like form, its center cut into a tunnel in the shape of a design Duchamp made for the entrance to André Breton’s Gradiva Gallery in 1937. Gradiva was the name of a mythical figure adored by the surrealists, the woman who could walk through walls. The brilliance of Duchamp’s design is that the two figures are ambiguous enough in their silhouette to be anyone but specific enough to be understood as two figures striding in joyous embrace forward, away from the viewer. Duchamp intended that they be read as a “shadow” of those who entered the gallery; Ai has transformed them into his own “mirrorical device,” installing a rippling reflective surface to fill their depth, like a cookie cutter’s shiny walls. It was unclear to me whether this inversion—shadow made reflective—was inspiring reflection in the people who passed through it. I saw most people mimicking the huddled shape only as they attempted to squeeze into a selfie together. Beyond his own well-known life story of exile, oppression, and migration, which has always been a defining feature of his art, politics, and public persona, Ai has been researching the state of refugees across the globe for years now. He just released a two-and-a-half-hour-long film, Human Flow, a near-comprehensive reportage on the migration of people who have left their countries due to “poverty, famine, and war.” Unlike his social media, which is filled with selfies, in his film, Ai stays on the edges as a watchful presence. We often see him recording with his iPhone, though we don’t often see his footage, as he travels to Greece, Bangladesh, Hungary, Jordan, Italy, Turkey, Lebanon, Gaza, Kenya, Afghanistan, Paris, Berlin, and the Mexico/United States border. 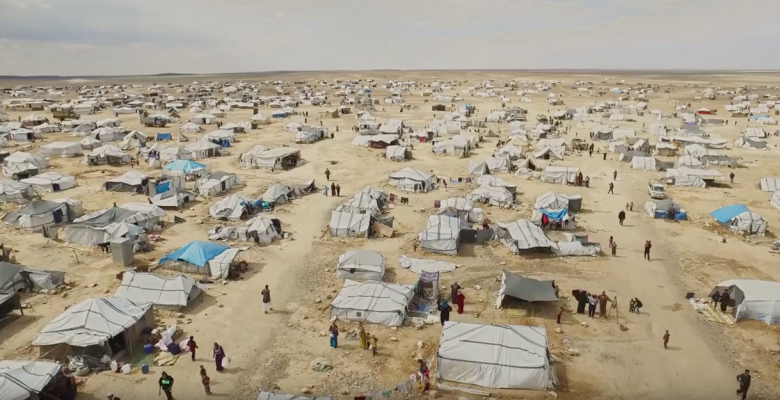 The film is respectfully restrained, with countless drone shots soaring over destitute refugee camps and makeshift shelters formed on the streets of Europe. It avoids making too beautiful the suffering of the people it documents, but keeps its distance almost to a fault. We see mostly crowds, statistics, and a headline ticker along the bottom of the screen, reporting the events of the past few years as Europe, in particular, scrambles to refuse or accept the overwhelming influx of refugees. If we hear from the refugees themselves, it is often emotionally raw and forlorn, a painful lament about their poverty, purgatory, loss, and boredom. And yet, these interviewees are not identified with lower thirds as the scholars and aid workers are. Toward the end of the film, a drone shot ascends into the sky to reveal an immense pile of life jackets. Over the image, Mohammed Fares, a former Syrian astronaut, says, “All human beings live in one big nation as brothers.” Ai does not offer a typical narrative arc; the film is bracketed with a sense of impossibility and immensity. As the drone camera floats away and above the earth again and again, the people become more and more abstract. 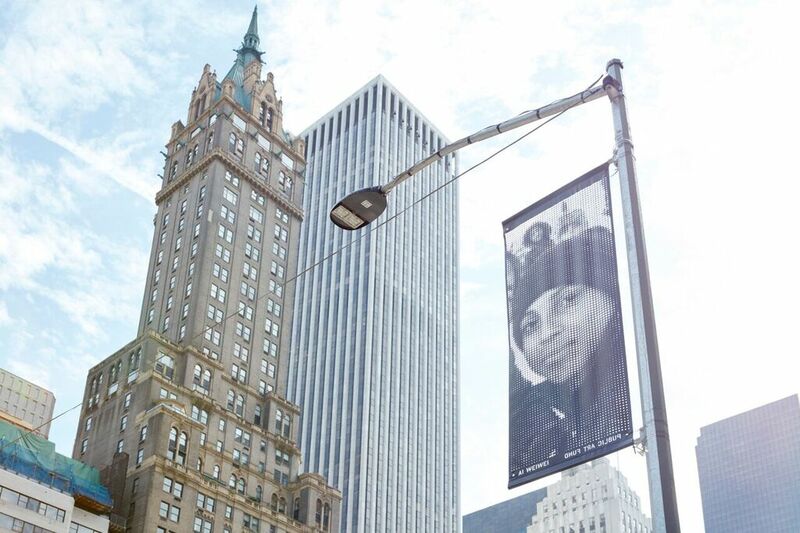 Many of the portraits on the banners hanging throughout New York were taken on Ai’s travels. The black plastic material they are made of is perforated, like a sieve with buildings, tree branches, and clouds running through it, leaving behind a face without a name. Ai has always been good at scale, at making enormous work with big ideas that many people can understand and share widely on the Internet. This topic is appropriately large, and his own experience makes him part of the story, but the project’s sprawling scope attenuates any conceptual or political approach to pervasiveness. Ai has cornered an artistic practice that, like the Sherman statue and the Washington Square Park arch, is monumental, both in scale and in function. But he is often pointing to the losers, not the victors, and making memorials to current, not past, events. In his TimesTalk Ai said that for “Good Fences” he is using the city as a “readymade,” putting an unexpected message in public spaces, but I’m not convinced of that classification. It’s true that he is using ordinary fencing as a medium, but the city is not the material, it is the exhibition space. His project did heighten my awareness of nearby, everyday resonances, but ultimately this work is classifying the city itself as a construct, while Duchamp aimed to classify art as one. I found it much more interesting when the work veered from the practices of both Duchamp and Ai, simply by being overlooked. Because they go unseen, these works are, like Duchamp’s dripping faucet, nonexistent, and they are profoundly unselfie-able. They are monuments unlike any Ai has ever made—more private, personal tokens of grief, like a stone placed on a grave or a memory in a diary. Ai has long made appeals to basic human dignity. He brings morality into art and bases it on an idealized universalism. For this project, he is using the word “refugee” as a shortcut to describe every complication known to mankind across the globe. But at that level, anyone would readily say they care about refugees; the refusal to actually help them comes once the details of the actual humans behind the word arise: religion, skin color, legality, poverty, politics, family size, education. That Ai has focused on the overwhelming scale of the problem dooms the project to be the very “embellishment of popular and mediocre sentiments” that he derided in 2006, the kind of oversimplification he complained about in his TimesTalk. Solidarity is an empty term without specificity; difference is the site of resistance. New York is a liberal sanctuary city and a temporary or long-term home to more than a half million undocumented immigrants. Ai’s creations may be simplified enough for the city’s viewers to project their experience on to it, but the people checking their makeup in the mirror of Ai’s arch and those smiling for selfies with it didn’t seem uncomfortable. Just like in the photographs being taken uptown with the Sherman statue, this new monument was quickly being reduced to a symbol of I-Was-There. Whether Ai’s project is an exposé of that response or not makes all the difference between the artist and the fool.